Yes, you see and read it right! The title of this blog has the words “trips” and tricks in it and not the usual “tips” and tricks that we normally see when techies write what they want to advise especially on new products and technologies. 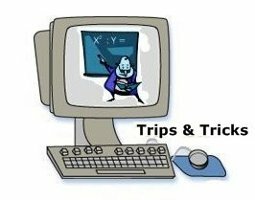 The word “trip” is used here in its slang or colloquial mode which means “intense interest or preoccupation” per definition 12-d at http://dictionary.reference.com/browse/trip. This blog post would reveal some of the negative practices of PC technicians which are the reasons why most of us would only deal or have our computers repaired by those whom we know or referred to us by trusted friends. These revelations would be useful to individual PC owners who cannot do the servicing of the equipment by themselves and more specially for i-café owners who hire PC technicians to do the repair of their units in their shops. Let me say offhand that what I will reveal here are not necessarily the practices of the majority of PC technicians. I still trust and believe that most of our PC technicians are doing their jobs honestly but, sad to say, there are really those who are doing the negative things I enumerate below to the detriment of the profession. I was prompted to write about this topic when an i-café owner who rely too much on his PC technician asked in a recent open forum about MS I-Café Program how he would know if he has genuine MS software installed by his technician. Two (2) things come to my mind when I heard the question which incidentally was not understood well by the presentor so he did not get a straight answer to his question. First, it could be that his technician asked him to buy genuine software for the units in his i-café but upon hearing the presentation, he is now in doubt if the software he bought were really installed on his units. This is one trick that a bad technician usually play on unknowing PC owners (i-café owners included). They ask you to buy a genuine software but install cracked versions on your PCs. They take note of the CD keys (license numbers) of the software you bought and install them to PCs of their customers who pay for them. The second thing that came to my mind is more serious. Your unscrupulous technician will advise you to just use pirated or cracked software which he could provide at a much lesser amount than what you will spend on genuine software. If you agree to his suggestion, not only did he earn more from you, your business is likewise put in jeopardy with the law for your violation of the intellectual property rights of the software developer. In both situations I mentioned, the i-café owner, who goes into the business without the knowing how such legal requirement is complied to, not only put his investment at risk. He may even get jailed for his ignorance of the law which could have been prevented if the PC technician he hired did not tricked him into making the wrong decision. There are more trips and tricks that bad PC technicians do and I will write about them in my future blogs. How would you like to post here some of them by way of comments to this article? Trust is really important in any relationship. It’s appalling that technicians from whom many people rely on could still trick customers just to get an upper hand (i.e. more money) from them. I guess it’s rampant because they’re getting away with it…just like in other professions. .-= Papa Sez´s last blog ..People’s Park of Davao City =-. Interesting that you brought up the use of original software, during my last visit to the Philippines I still saw rampant pirated software sold out in the streets.